"Queen Mary 2 Rescue at Sea" - - QM2 rescues a solo yachtsman during an Atlantic storm. 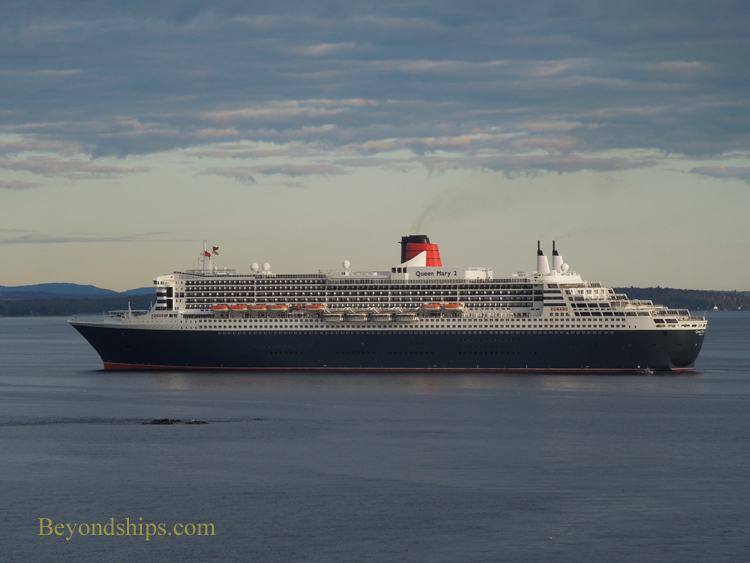 ​"Big and Bigger" - - A comparison of Queen Mary 2 and Royal Caribbean's Freedom of the Seas. "Talking QM2 Remastered" - - Carnival Corp. CEO Arnold Donald, Captain Christopher Wells and others speak about the 2016 refurbishment of QM2. "Captain Peter Philpott" - - An interview with Captain Philpott. "A Non-Traditional Commodore" - - Commodore Christopher Rynd shares his vision for being master of Queen Mary 2 and Commodore of the Cunard fleet. "An Interview With Captain Christopher Rynd" - - Then-Captain Rynd discusses the Princess ships he has commanded as well as commanding QM2, QE2, and the Queen Victoria. "An Important Ship" - - an in-depth profile of QM2 including an interview with Commodore Bernard Warner (ret.). "The New QM2" - - A conversation with QM2's first master, Commodore Ronald Warwick (ret.). officer on QE2 in the 1990s, participating in the construction of Queen Mary 2 and, most recently, commanding QM2. Wright (ret. ), the first person to have commanded three Cunard Queens. "Transatlantic on Queen Mary 2" - - Hotel Manager David Shepard discusses what QM2 does best. impact on passengers. Mr. Brand discusses his philosophy and goals in heading this organization. interview with then-Staff Captain Trevor Lane focusing on the role of the staff captain on Queen Mary 2. "Keeping On Good Terms With The Environment" - - Environmental Compliance Officer Ariadna Mayoral talks about about QM2's commitment to the environment including its recycling and waste disposal. "A Conversation with Joanna Haley" - - An interview with Entertainment Director Jo Haley about entertainment of QM2 and the impact of the 2016 Remastering. ​"An Interview With Ray Rouse" - - A conversation with QM2's entertainment director. He discusses shaping modern mega-ship cruising as the first cruise director for many of Royal Caribbean's giant cruise ships. He also discusses the factors that make voyaging on QM2 different than cruising on the large cruise ships. entertainment and activities for QM2. "Second To None" - - Entertainment Director Keith Maynard talks about what makes QM2 unique. Royal Academy of Dramatic Arts Program on Queen Mary 2. "A Look at the Canyon Ranch SpaClub on Queen Mary 2"
"The Steakhouse at the Verandah" - - Review of the pop-up specialty restaurant with comments from Hotel General Manager Robert Howie. "Reflections of a Top Sailor" - - A look at the presentations recognizing the most-traveled guest on each cruise. Art Exhibit: "Drawing on Style: Original Fashion Illustration"